It’s been a long-time goal of ours to live-stream video from Commencement, making the event accessible to viewers all over the globe. With the help of our friends in ITS, we are closer to reaching this goal. Unfortunately, internet connectivity at the event venue proves challenging. A recording of the event was successful and a low-quality stream was achieved, but we are hopeful that we’ll be set for a full-on live-stream of the April 2012 Commencement ceremony. In the absence of live video this go-round, we did our best to provide a connected online Commencement experience on December 11. 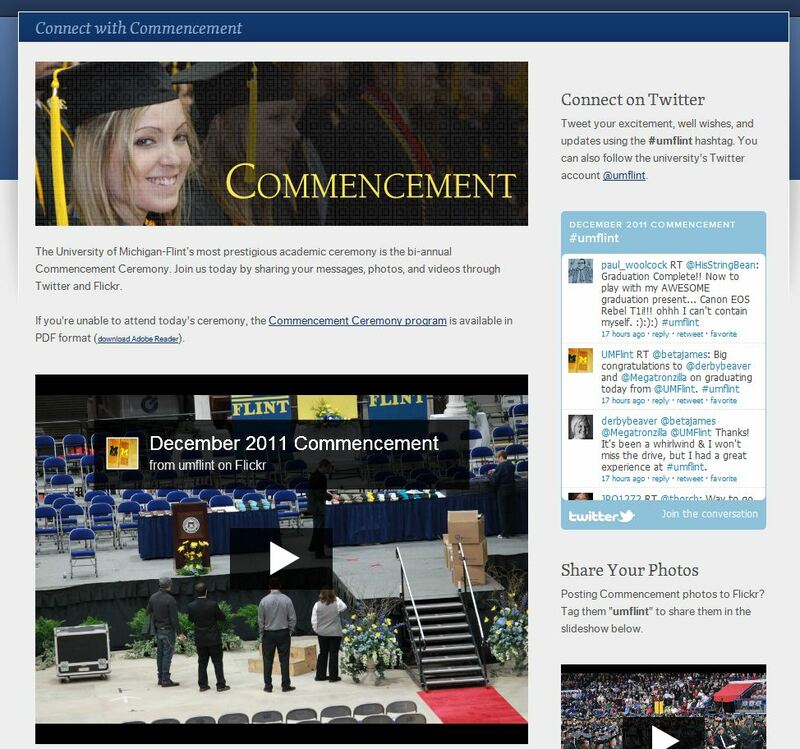 A “Connect with Commencement” website was created that featured photos uploaded throughout the day. Tweets using the #umflint hashtag were also collected to help spread the excitement and congratulations. So that the community could share their own photos, the website included a slideshow of all photos posted to Flickr and tagged “umflint” on Sunday. No photos were tagged. In the future, we’ll monitor the Flickr traffic during Commencement before promoting this feature on the web. Overall, we were pleased with the success of our efforts! We will continue working toward a live video web broadcast for Commencement, but the social media integration we achieved this time around will definitely be put to good use from here on out. View the December 2011 Commencement photo set on Flickr. View the Storify archive of the Commencement social media activity.